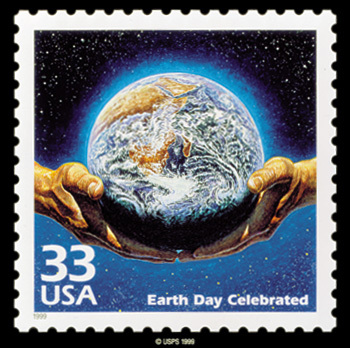 The first EARTH DAY, celebrated in the United States, was on March 21, 1970. It has been celebrated each year thereafter at the United Nations, bringing attention to its original purpose: peace, justice and the care of Earth. Earth Day -was first proposed by John McConnell in early October 1969 to a few members of the San Francisco Board of Supervisors and other community leaders especially interested in caring for and improving our natural environment. 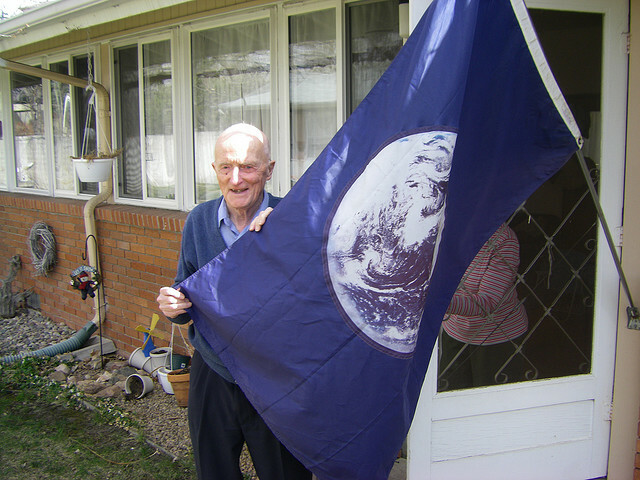 On November 25, 1969, the final day of the UNESCO National Conference, "Man, and His Environment," Cynthia Wayburn, one of the youth leaders on Mr. McConnell's Earth Day Committee, presented the idea and showed the Earth Flag during this presentation at the luncheon. On March 21, 1970. The first Proclamation of Earth Day was by San Francisco, the City of Saint Francis, patron saint of ecology. Designating the First Day of Spring, March 21, 1970 to be Earth Day, this day was later sanctioned in a Proclamation signed by Secretary General U Thant at the United Nations where it is observed each year. From the beginning the proposal called for observance of Earth Day on March 21st, which is the Vernal Equinox. This is the moment when night and day are equal throughout the Earth --reminding us of Earth's beautiful systems of balance which humanity has partially upset and must restore. From Humanity's earliest history people of many cultures have celebrated this day as the beginning of spring - symbolizing renewal of life. Earth Day will be observed at United Nations Headquarters in New York City the first day of spring (Nature's Day) in the Northern Hemisphere and autumn in the Southern Hemisphere. At exactly 14:16 Eastern Standard, the moment of the vernal equinox, the Peace Bell will ring at the UN in New York followed by two minutes of silent prayer or meditation. At the same moment the Peace Bell at the United Nations in Vienna will ring. 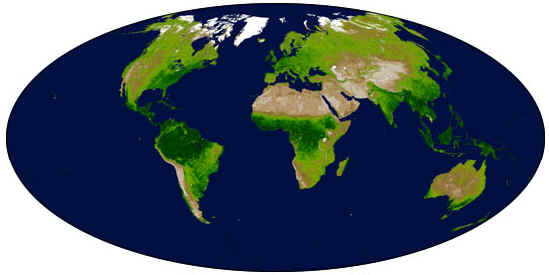 Senator Gaylord Nelson and Denis Hayes, founder of The Bullitt Foundation, are the founders of this Earth Day. 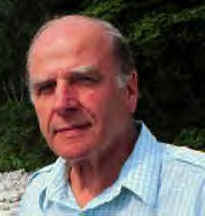 Gaylord Nelson, a U.S. Senator from Wisconsin and a long time conservationist, was one who understood that the methods developed for use in the anti-war protest could succeed in other areas as well. "At the time," Nelson later wrote, "there was a great deal of turmoil on the college campuses over the Vietnam War. Protests, called anti-war teach-ins, were being widely held on campuses across the nation.... It suddenly occurred to me, why not have a nationwide teach-in on the environment? That was the origin of Earth Day." 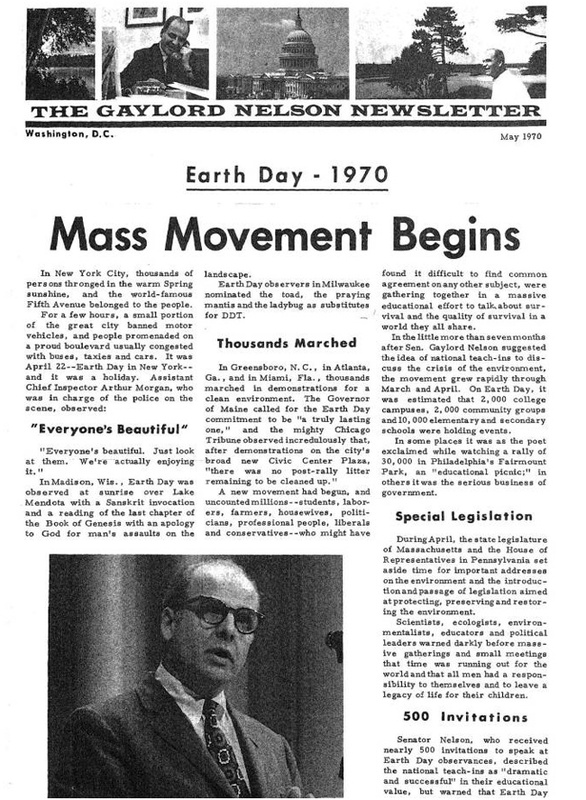 Nelson began promoting Earth Day to state governors, mayors of major cities, editors of college newspapers, and, importantly, to Scholastic Magazine, which is circulated in U.S. elementary and high schools. In September, 1969 Nelson formally announced that there would be a "national environmental teach-in" sometime in the Spring of 1970. "The wire services carried the story nationwide," recalled Nelson. "The response was dramatic.... Telegrams, letters, and telephone inquiries poured in from all over the nation. Using my Senate staff, I ran Earth Day activities out of my office. By December, the movement had expanded so rapidly that it became necessary to open an office in Washington to serve as a national clearinghouse for Earth Day inquiries and activities. "Earth Day achieved what I had hoped for. The objective was to get a nationwide demonstration of concern for the environment so large that it would shake the political arena. It was a gamble, but it worked. An estimated 20 million people participated in peaceful demonstrations all across the country. Ten thousand grade schools and high schools, two thousand colleges, and one thousand communities were involved... That was the remarkable thing that became Earth Day." The name national environmental teach-in was later changed to Earth Day. "For many years prior to Earth Day, it had been troubling to me that the state of our environment was simply a non-issue in the politics of our country. The President, the Congress, the economic power structure of the nation and the press paid almost no attention to this issue, which is of such staggering import to our future. It was clear that until we somehow got this matter into the political arena -- until it became part of the national political dialogue -- not much would ever be achieved." said Senator Nelson. Senator Nelson argued early and often against the Vietnam war, and helped pass major environmental laws in the Senate.